This BMW X1 is the second generation of the company’s smallest crossover. There’s been a major change this time around. It’s based not on a natively rear-drive platform, but on BMW’s new front-drive/4WD components (the same setup is already used in the 2 Series Active Tourer MPV). This means a transverse engine, freeing up extra cabin space. As expected, the second-gen X1 sports an evolutionary design with styling cues borrowed from its bigger siblings, the X3 and X5. The front fascia features a slightly bigger twin-kidney grille and longer, sleeker headlamps. Down below, the X1 received larger fog lamps and larger air intakes, making it seem not only bigger than its predecessor, but more aggressive as well. In all, it seems as if the X1 is no longer the ugly duckling of the BMW crossover family. When viewed from the side, the X1 seems nearly identical to its predecessor from the waist down. The trademark beltline is still in place, while the side skirt area is creased in a similar fashion as on the previous model. However, things are different from the waist up, with a taller glass area, a bigger quarter window, and a raked roofline. The rear fascia has received its fair share of upgrades as well, starting with significantly larger taillights, which look way better than the previous units, and a better sculpted tailgate and upper bumper area.Overall, it seems the X1 has become a baby X5, and there’s nothing wrong with that. Mini SUVs aren’t exactly appealing design-wise, but BMW tried really hard with the X1 and the result is quite good. Inside the X1 customers will find a fully redesigned interior. Even though the new cabin is also evolutionary and carries over some of the previous model’s cues, the crossover has plenty of new features to brag about. What’s more, it offers a lot more room than its predecessor, as well as enhanced luggage space.Legroom has increased by 1.5 in standard specification and up to 2.6 inches with the optional adjustable rear seat. Also, the seating position has been raised by more than one inch in the front and more than 2.5 inches in the rear. Cargo space has been increased by around 15 percent with the rear seats folded flat. Moving over to styling, the dashboard now features a cleaner design, mostly thanks to the “floating” display and the smaller A/C vents. A vertical aluminum trim splits the dashboard in two horizontally giving it a classier appearance. The center stack sits closer to the infotainment screen allowing for increased storage space in the center console.The laundry list of standard features includes a seven-speaker audio system, a multifunction, leather-wrapped steering wheel, and cruise control. The standard seats come dressed in cloth, but customers can select a leather upholstery from the options list. Other options include an 8.8-inch display, a 12-speaker Harman Kardon sound system, a panoramic moonroof, and many more. Being in the driver’s seat of a BMW naturally gives you a lot of extra confidence because you know by default that the car will have its dynamics nicely sorted. The same thing happened when I took a corner at a speed I can’t mention here unless I want my mom to make me resign from my job. While our dear editor Faisal held on for life with both his hands on the ceiling grab bars, the X1 attacked the corner perfectly well maintaining it’s line. Sure, there was some screeching and the TCS light went crazy, the Bimmer stayed composed and never did it throw tantrums. Ride quality isn’t the best though and while it soaks up minor bumps very easily, the more nastier potholes do manage filter in the cabin at low speeds. At high speeds, the story is completely different and the X1 stays firm. The tyres have splendid levels of grip which we found out during our handling and braking tests. The BMW X1 comes with multiple airbags, ABS with EBD, ESP and other safety features that one expects in a luxury vehicle. 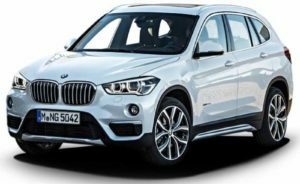 The BMW X1 offers all the features that one will need for the price paid.The BMW X1 is well specced across the models but the M Sport gets some exclusive features. Let’s start with what all the variants get – LED headlamps with cornering function, rain sensing wipers and auto headlamps, dual zone climate control, an auto-dimming inside rear view mirrors, push button start and auto start-stop. Safety is a priority and all variants get six airbags, ABS and a comprehensive stability control package. Now onto the stuff only the top M model has – leather seats, the larger iDrive screen with a touch-sensitive controller, HUD and of course, the M Sport visual goodies. Strangely, this is another expensive German car that doesn’t offer the very practical feature of keyless entry found on run-of-the-mill Rs-7-lakh hatchbacks. If you look at the X1 as an entry-level BMW, you won’t be disappointed at all because the car has evolved very nicely from the previous generation and it feels very good as an overall package. Yes, it misses out on some very vital equipment but this shouldn’t really be a deal breaker. The X1 also gets an AWD system now which makes it a proper compact SUV. The 2016 BMW X1 makes for a splendid buy if you’re looking at entering the elite club but don’t want something as basic as a 1-Series or something. Even when compared to rivals, the X1 feels more of an SUV compared to the Mercedes GLA while the Audi Q3 is something that’ll give a tough fight to this Bimmer.